When collaborating with your team in apps like Gmail and Calendar, you’re able to quickly look up their information by tapping on their profile photo. 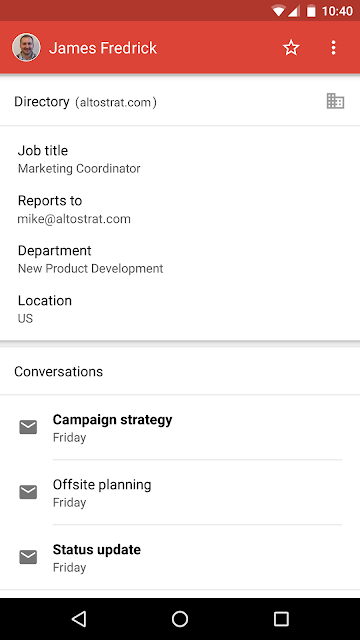 Today, we’re rolling out an improvement to this integration on Android devices by surfacing new information from the domain directory, including job title, manager, department, and location. Now when you tap on somebody's profile photo, the information that’s available in the domain directory will be shown in the new “Directory” card, making it easier to understand that person’s job function. This feature is enabled for any G Suite domains which have the domain directory enabled from the Admin console.